The two killed were 54-year-old engineer Michael Kempf of Savannah, Georgia, and 36-year-old conductor Michael Cella of Orange Park, Florida. 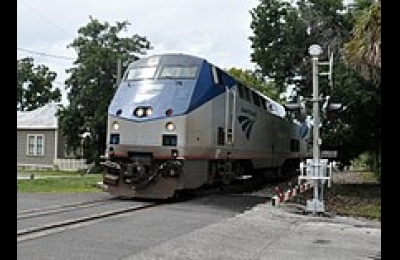 Robert Sumwalt, chairman of the National Transportation Safety Board, told a press conference the passenger train had been diverted into a siding by a switch left "literally locked, with a padlock" in that position. The collision happened at about 2:35 am local time (0735 UTC) at a switching yard in the small city of Cayce. The Amtrak train, with reportedly 139 passengers and eight employees aboard, collided head on with the freight train, which was parked with no one on board. The Amtrak locomotive and the leading locomotive on the freight train were destroyed; the Amtrak locomotive and some of its passenger cars derailed, and one of those cars was folded in half. Several freight cars were crumpled, Reuters reported. In a press conference, the state governor, Henry McMaster, said the Amtrak locomotive was "barely recognizable" and described it as "a horrible thing to see, to understand the force involved". Harrison Cahill, a spokesman for Lexington County, gave a count of 116 injured, up from an initial report of 70; according to Derrec Becker, public information officer for the South Carolina Emergency Management Division, injuries ranged "from cuts and bruises to severe broken bones". On Monday a Palmetto Health spokesperson said two patients were in serious and two in critical condition at their facilities. A spill of approximately 5,000 gallons of fuel from the freight train posed no safety hazard, according to officials. Passenger Derek Pettaway told the CNN network that like most others, he had been sleeping when the collision happened. He said Amtrak staff cleared the passengers from the train rapidly, and there was no panic; "I think people were more in shock than anything else", he said. "Key to this investigation is learning why the switch was lined that way", Sumwalt said. Amtrak's CEO, Richard Anderson, speaking to reporters on Sunday, held CSX responsible; he stated the track in that area is operated by CSX and the signals, which CSX operates, were not working at the time of the collision and a CSX dispatcher was therefore directing the Amtrak train's movements. Sumwalt noted an automatic monitoring and braking system called positive train control, which was not in use on the stretch of line, could have forestalled the collision.